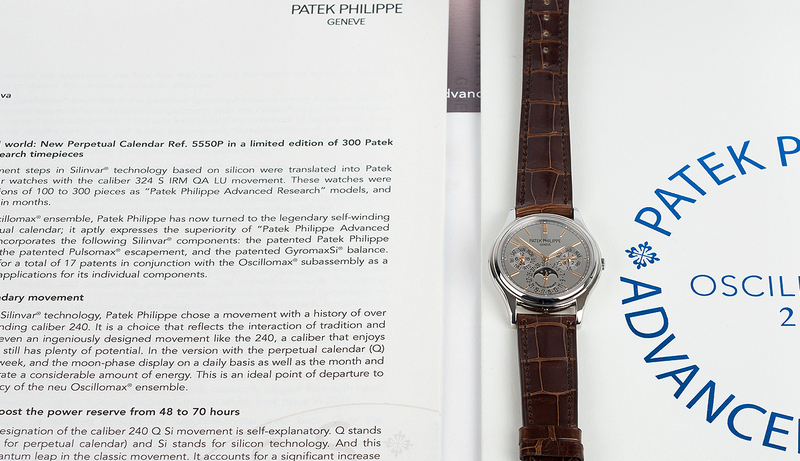 This marvel of engineering is one historically significant piece of unobtanium from the great Patek. Never one to rest on laurels, Patek Philippe has been leading the way in mechanical watchmaking innovation for some time. In 2011, their ‘Advanced Research’ division (roughly 70 R&D employees who enjoy an experiment) created the first entirely silicon escapement. The wheel, fork, balance, and hairspring are all entirely silicon. That’s no easy feat to create, but improved geometry lends a 50% higher power reserve than the base 240 QP (a feat in its own right). The piece was hugely expensive to manufacture, and was limited to 300 pieces. They sold out immediately upon release in 2011. This Advanced Research model is extremely rare at auction and usually jumped upon quickly. The base 5550P case remains, a 37mm platinum beauty. All Advanced Research models of this period received unique silver brushed dials. The contrasting hands and indices weren’t to my taste at the start, but they’ve grown on me. The rest is a simple, timeless perpetual calendar. Finishing remains exquisite as one would expect. Sadly, this not the sort of watch that is likely to be worn anywhere; this is an investment. This example appears nearly unworn with full set. When likened to stocks or property, this 5550P a more tangible and glamorous means of distributing wealth. It’s worth noting that as an investment, this is not a bad time to throw down. This reference is a few years behind release and yet to gain any historical credibility. As for today, it remains a bit of internet eye candy for the aspirational. I wouldn’t expect it to hang around. Find it here for 109500 GBP.